‘Margarita’ Carolina Jasmine was one of the 2005 Gold Medal Plant Winners of the Pennsylvania Horticultural Society. This coveted award means that this is a truly special plant and worth considering for your landscape. ‘Margarita’ is a fine-textured evergreen vine with a twining growth habit. It produces fragrant yellow trumpet-shaped flowers in late March into April. ‘Margarita’ grows almost anywhere, with characteristics such as drought-tolerance, deer-resistance, and soil adaptability. This native will scramble up or cascade over obstacles, creating a mass of living color. 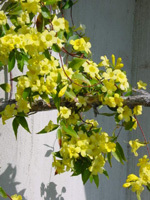 Plant Carolina Jasmine in sun or part-shade. Grows to 12 feet high and about 6 feet wide. It is hardy in zones 5b to 9.